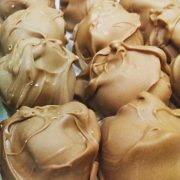 Our delicious Belgian chocolates are hand-crafted by our highly qualified chocolatier who has trained with the best in Europe. We have various sized boxes of delicious hand-made truffles in 3 chocolate flavours which can be shipped worldwide. Easter and Christmas we have various designs available of chocolate eggs and novelties available in our shop.